Can I give my dog bananas? You bet! 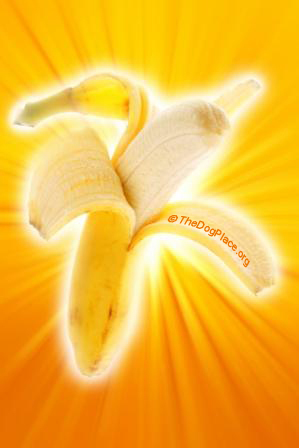 A psych class professor teaches his students why bananas are healthy stress reducers and brain boosters - we call it mood-food for dogs! While not all people foods are good for dogs, bananas and most other fruits are not only natural for dogs and their closest kin, foxes, bears, coyotes and wolves, but they have major health benefits. Most dogs love bananas. Dog show exhibitors will remember Ch. Lord Timothy Scott, a top-winning bulldog handled by Carroll James. Carroll baited Timmy with bits of banana and while messy, that's what Timmy loved most and he "showed" it to everyone! Bananas contain three natural sugars - sucrose, fructose and glucose combined with fiber. A banana gives an instant, sustained and substantial boost of energy. Research has proven that just two bananas provide enough energy for a strenuous 90-minute workout. No wonder the banana is the number one fruit choice among top athletes. Energy isn't the only way bananas help us keep fit. In addition to being a perfect bedtime snack (induces restful sleep) bananas can also help overcome or prevent a substantial number of illnesses and conditions, making it a must to add to our daily diet. Heartburn: Bananas have a natural antacid effect in the body, so if you suffer from heartburn, try eating a banana for soothing relief. And when you swallow a pill that gets stuck in your esophagus, medical experts advise grabbing a bite of banana. The consistency is just right to push the pill down. Morning Sickness: Snacking on bananas between meals helps to keep blood sugar levels up and avoid morning sickness. Many pregnant dogs suffer from a canine version of morning sickness. Try it and if it helps your dog, let us know. Overweight: Studies at the Institute of Psychology in Austria found pressure at work leads to gorging on comfort food like chocolate and chips. Looking at 5,000 hospital patients, researchers found the most obese were more likely to be in high-pressure jobs. The report concluded that, to avoid panic-induced food cravings, we need to control our blood sugar levels by snacking on high carbohydrate foods every two hours to keep levels steady. Show circuits have become longer and thus more stressful on exhibitors and dogs. Perhaps sharing a banana with your dog before going in for Group will give you both a needed boost. Stress: Potassium is a vital mineral which helps normalize the heartbeat, sends oxygen to the brain and regulates the body's water balance. When stressed, the metabolic rate rises, thereby reducing potassium levels, which can be rebalanced with a high-potassium banana snack. Blood Pressure: This unique tropical fruit is extremely high in potassium yet low in salt, thus said to reduce blood pressure. So much so, the US Food and Drug Administration allowed the banana industry to make official claims for the fruit's ability to reduce the risk of blood pressure and stroke. Hangovers: Okay this doesn’t relate to your dog but one of the quickest ways of curing a hangover is to make a banana milkshake, sweetened with honey. The banana calms the stomach and, with the help of the honey, builds up depleted blood sugar levels, while the milk soothes and re-hydrates your system. Temperature control: Many cultures see bananas as a "cooling" fruit that can lower the physical and emotional temperature of expectant mothers. In Thailand for example, pregnant women eat bananas to ensure their baby is born with a cool temperature. Strokes: According to The New England Journal of Medicine, eating bananas as part of a regular diet can cut the risk of death by strokes by as much as 40%! So, a banana really is a natural remedy for many ills. When compared it to an apple, it has four times the protein, twice the carbohydrate, three times the phosphorus, five times the vitamin A and iron, and twice the other vitamins and minerals. 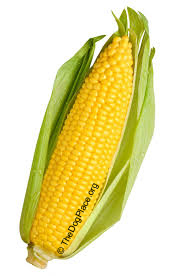 It is also rich in potassium and is one of the best value foods around. So maybe its time to change that well-known phrase so that we say, "A banana a day keeps the doctor away!" Why do we call it MOOD-FOOD? Bananas must be the reason monkeys are so happy all the time.